Location and price really matter in storage. Any poor choices placing data will cost you dearly, but choose wisely and the cost savings become significant. Stick to two guiding principles and you’ll do just fine; a) Devote your fastest storage space to your most time-sensitive workloads, and b) don’t waste your premium-priced storage space on content that seldom gets accessed. If it were only that easy. Truth is that unlike home buying habits, user access patterns change very frequently. Content that was driving interest one day becomes old news the next. And there’s no way you could possibly take the time to shuffle information around to keep up with their fickled ways. That’s where insider knowledge and a little automation come in handy. The science of automated storage tiering distills down to monitoring I/O behavior, determining frequency of use, then dynamically moving blocks of information to the most suitable class or tier of storage device. DataCore™ SANsymphony™-V software automatically “promotes” most frequently used blocks to the fastest tier, whereas least frequently used blocks get “demoted” to the slowest tier. Everything else floats to the middle. Of course, there will be exceptions, especially when you need to assign high performance storage to an infrequently used volume, as in special end-of-quarter processing. In these cases, you can pin specific volumes (virtual disks) to a tier of your choosing, or define an “affinity” to a particular tier. Only if that tier is completely exhausted, will a lower tier be chosen. 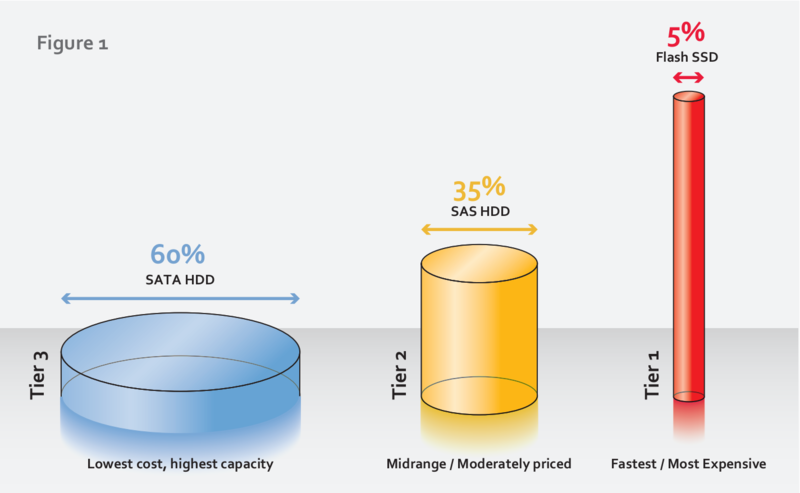 In order to appreciate the financial motivation for auto-tiering, consider the price/performance differences among the three most popular classes of disks in use today. Leading with the highest performance at the steepest price are Solid State Disks (SSDs). Next are Serial Attached SCSI (SAS) drives, followed by the most economical Serial ATA (SATA) disks. For random disk read patterns, SSDs are said to be 25 to 100 times faster than SAS hard disk drives (HDDs) at roughly 15 to 20 times higher cost per Gigabyte. In practice, SSDs substantially reduce the number of HDDs required for heavy random I/O pattern. Just one SSD PCI I/O card may yield the equivalent of 320 hard disk drives. That’s 300 times less hardware to house, maintain, cool, and watch over. In general, you wouldn’t want to waste the premium priced SSD capacity on infrequently used blocks, so the DataCore software will keep the least active information on the lowest cost, capacity-optimized SATA disks corresponding to Tier 3. On the other hand, when the auto-tiering algorithms detect sustained heavy use of certain other blocks, they will naturally bubble up to the Tier 1 SSDs. Unlike the narrow and often rigid classification done inside disk enclosures, DataCore storage virtualization software allows you to define tiers according to your own price/performance index. Perhaps your diverse storage pool consists of top-shelf, premium disk arrays from one vendor, mid-range RAID subsystems from another, and relatively inexpensive racks of unintelligent disk drives (JBODs). You define what constitutes each tier, relative to the other members of the pool. You may set up as many as 16 tiers, although 3 or 4 tiers are usually enough to help you make good tradeoffs. As new storage products arrive on the market, the top rung could shift down to make room for an even higher performing, albeit costlier, disk technology.